Known as one of the pioneers of biomedical informatics, Warner’s research in the 1950s fueled the idea that computers could be used to improve patient care. The use of electronic medical records (EMRs) today is merely the tip of the iceberg perched upon years of Warner's cerebral sweat and passion-driven analysis. Warner’s imprint is not only found in today’s medical technology, but also on the hundreds of students he taught in his labs and in classrooms throughout his long career. As the chair and founder of the world’s first degree-granting Department of Biomedical Informatics (1962), he help guide more than 200 students through their Ph.D.s. “You know you’re old when your students start retiring,” quips Warner, naming some of the graduates who went on to prestigious and formative positions in the field. “He was a hands-on teacher who for some reason never really intimidated us,” recalls Reed Gardner, a former student who became second chair of the department. “He’d say, ‘well if you’ve got an idea, go and try it,’ giving us remarkable freedom in terms of helping us gather data from real clinical situations. This was and is even today exceptionally unique.” Access to the U’s clinical setting, allowed Warner to implement his research immediately, propelling his work forward. Warner’s early research focused on the heart and he developed computers to analyze pressure waveforms, eventually moving them from the lab to the operating room and then to the Intensive Care Unit (ICU). Today’s ICU monitoring systems hail back to Warner's early innovations. “He sort of figured out the calculus of the heart,” says his son, Homer Warner, Jr.
Gardner put his electrical engineering talents to use in collaboration with a computer system Warner had developed. This system was set up in the ICU for heart patients; it would flash red, yellow, or green, signifying different readings. One day, Warner walked into that ICU and watched a nurse become confused about what to do after a yellow light had gone on. “The venous pressure was rising, the arterial pressure was going down, and the cardiac output was dropping, and she didn’t know what to do,” recalls Warner. She was overloaded with information. The nurse only needed some guidance, perhaps from the computer itself, thought Warner, whose mind began pursuing a solution. In 1968, during what Warner calls “the most productive week of his academic life,” he wrote the first version of the software program for the HELP system (Health Evaluation thru Logical Processing). This was the first computer-based medical record in which medical logic evaluates patient data in order to give the care provider assistance. It would generate alerts, reminders, and messages in accordance with best care standards, differential diagnoses, and provide critiques or suggestions for interventions. As it became more and more refined, it was populated by information from the pharmacy, clinical laboratory, infectious disease, cardiology, pulmonary function testing and diagnosis from history data. “HELP is probably regarded as Warner’s most significant contribution to the field,” states Paul D. Clayton, Ph.D., former chair of Medical Informatics at Columbia University. 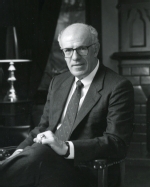 “To my knowledge, this was one of the first operational systems to have a separate knowledge base in the 1970s.” Eventually, once the technology was sold, University of Utah Hospital purchased the HELP system, and the U’s president at that time, Chase Peterson, M.D., convinced Warner to move his labs at LDS hospital over to the University of Utah in 1980. Once there he developed the Iliad, a computer program that helped train medical students on how to diagnose patients. Sorenson recalls working late one night in the lab when the phone rang. It was Warner calling in to check with the night lab technician about rebooting the computer (he had a connection to it at home). “What are you doing there?” he asked Sorenson, when he picked up the phone. “Well, I’m really interested in what I’m doing and having a lot of fun with it,” replied Sorenson, who then asked why Warner was calling at 2 am? “For the same reasons,” responded Warner. Another mathematical concept, Transfer Function (what happens to each of its frequency components as a wave form passes thru a system), prompted Warner and his colleagues to build their first analog computer. “I wasn’t a mathematician, but with this machine I could solve equations,” says Warner. NIH grant money followed resulting in a more refined computer used for diagnostic studies on heart patients.”For the first time, we could measure directly in a living person the distensibility of the artery, the frictional resistance of the artery, and the inertia of the blood column, which corresponded to the electrical components of our computer model,” recalls Warner. By 1962, Warner’s research was attracting more and more students. Henry Eyring, Ph.D., Dean of the Graduate School commented, “It’s a shame, Homer, that your students can’t get a label that will tell people what kind of training they’ve had. You really ought to have a department.” With Eyring’s help, the Department of Biophysics and Bioengineering was established in the engineering school. Later it would move into the medical school and eventually become the world’s first Department of Biomedical Informatics. Forty-five years later, the department has educated more Ph.D. students than any other department. Researchers would come from around the world to check out their labs and see what health informatics was all about. “He pioneered the whole concept,” says Joyce Mitchell, Ph.D., current chair of the Department of Biomedical Informatics and associate vice president for Health Sciences Information Technology. “I didn’t realize we were number one at the time, though I did know we were on the map,” recalls Warner, who was always more focused on his research than the spotlight. You have to do your own digging to find out that Warner received the prestigious NIH Research Career Award, was president of the American College of Medical Informatics (where an award has been created in his honor), founder and editor of the field’s academic journal for 26 years, among many other accolades. He is a lighthouse to those in the field now having lit the way in what was once indistinguishable terrain. “When I left Homer’s labs for medical school at Cornell, I became even more aware of how respected Homer was as I listened to people talk about him and his work,” recalls Sorenson. When the University purchased their first digital computer in 1960, Warner saw the Holy Grail. “I knew there were things we could do with this that we could never do without it. It could give you equations that you couldn’t solve without it.” When Robert Stephenson, then Dean of Electrical Engineering, showed Warner an article about using Probability Theory to model the diagnostic process, he decided to try to apply the idea to congenital heart disease using the digital computer. Working with graduate students late at night when the computer was available, they proved that it could diagnose as well as or better than cardiologists. “We built a model of the intellectual process a doctor employs to make a diagnosis,” explains Warner. When they presented their findings at an American Heart Association meeting, it raised quite a stir among physicians, who demoted the idea as being ridiculous that a computer could “diagnose and think.” The study resulted in a an NIH grant for a digital computer at LDS Hospital. It was his mom’s dream first; she wanted her son to be a doctor. In school, Warner was mainly interested in girls and football and didn’t view himself as a good student. It wasn’t until his first year in medical school, when a professor of physiology, Horace Davenport, Ph.D., who referred to the class as “a group of dummies,” stumped everyone but Warner with a difficult question. “That experience gave me the confidence that I could do well in medical school,” says Warner, who found both a mentor and an admirer in Davenport as time went on. Warner’s most influential mentor, other than his father, was cardiologist Earl Wood MD, PhD, whom he worked for during his internal medicine residency at the Mayo Clinic in Rochester, Minn. Wood was one of the first to develop heart catheterization (open heart surgery was just beginning). He encouraged Warner to turn his research into a thesis and earn a Ph.D. in physiology at the University of Minnesota. “Earl unlocked this whole area for my dad, who hadn’t really looked at the possibilities of a career in research,” points out Warner, Jr. Returning to Utah in 1952, Warner was invited by Ray Rumel MD, the only heart surgeon in town, to establish a Cardiovascular Lab at LDS Hospital similar to Wood’s. He also joined the medical faculty at the University Utah. Throughout his career, Warner was as committed to his wife, Kay, and their six children as he was to his career. Friends recall him leaving work early to catch a dance recital or Boy Scout activities. He writes letters to his grandchildren sharing his life with them and his excitement for what they are experiencing. "Work in spurts" was his advice, when asked how he accomplishes so much. Outdoorsy and athletic, Warner is also an avid and self taught sailor; he took a six month sabbatical in 1982 with family and sailed his 40-ft sail boat, Daisy, in the Victoria to Maui Race to Hawaii and finished last. He’s quite proud of this, mentioning some of the world class sailors he was able to meet.